Back in April we blogged about a natural-gas pipeline explosion and fire in the marshes of Louisiana, hot enough to see on low-resolution MODIS satellite imagery. We got the heads up about this explosion from the SkyTruth Alerts system. The descriptions were pretty dramatic: a fireball seen from miles away; flames shooting hundreds of feet in the air. This fire started on 4/9/2012 about 23 NM SW of Houma, LA. I was up flying a routine maintenance flight when some helicopters started reporting thick smoke about 23 SW of Houma. I flew down by the fire. We could see it when we were about 15 NM from the fire at 1,000 feet AGL. The smoke was caused by the grass that was on fire next to the explosion. When the grass burned off, the smoke went away but the hot fire continued. The smoke and heat went up to approximately 1,000 feet AGL. When the smoke went away, we could see visible soot up to 800 feet. We circled the fire for awhile. You can notice the water boiling, maybe from the pressure, or heat, I’m not sure. It was a sight to see. …I noticed the fire because of a helicopter reporting it on the tower frequency. I was flying a routine maintenance flight, and my first concern was if anyone was injured. I was looking for a boat or people who may have been at the buildings next to the fire. I didn’t see anyone around. 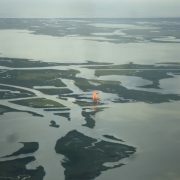 Aerial photo of burning pipeline in Terrebonne Parish, Louisiana on April 9, 2012. Photo courtesy of Adam Tjelmeland. Lately coal export has been getting a lot of attention in the media. Exporting coal from the US to overseas markets means an increase coal mining activity and an increase in train traffic through communities between the mines and coastal export terminals. Last fall, I blogged about the massive 7,500 foot long coal trains, to get a feel for how this might disrupt those communities. This time around, we are taking a look at the “business end” of coal-export: the actual mining of the coal. The National Wildlife Federation (NWF) is concerned about what coal export means for the landscapes and habitats of the Rocky Mountain West. They asked if we could produce a few visualizations to illustrate how much of the land is being affected by mining, and would likely be affected if we ramp up coal exports. Outline of the Powder River Basin in Montana and Wyoming. Black Thunder Mine shown in red. All other mines shown in orange. Using Google Earth Pro, I delineated all of the mining activity in the Powder River Basin (PRB) of Wyoming and Montana, the main coal-producing region in the Rockies that would feed the export market. I then imported the file into ArcGIS. There, I placed the mining activity over a map of the US, and created an inset map to show a closer view of a heavily mined area (see map above) about 40 miles south of Gillette, Wyoming. I homed in on the Black Thunder Mine (shown in red) to demonstrate how mining activity in the PRB has increased over time. Seen below, is the mine as it appears on black-and-white aerial survey photography shot in 1995. The lighter areas on the image show the bare dirt and rock of actively mined areas. 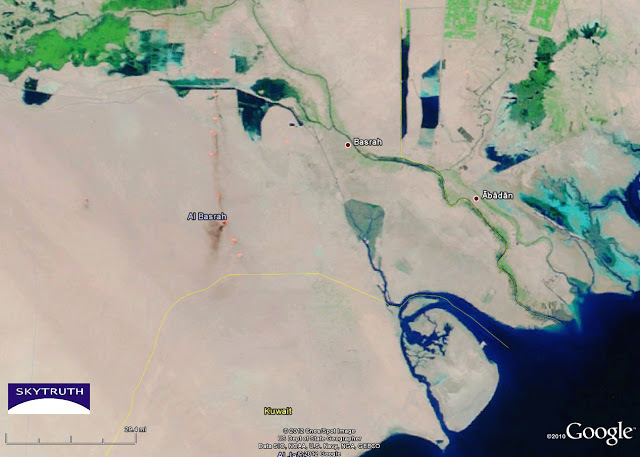 The red outline shows how much land had been directly impacted by mining sixteen years later, in 2011. It has grown 29.3 square miles in that 16-year period. The Black Thunder Mine, located in the Wyoming section of the PRB, as of 1995. 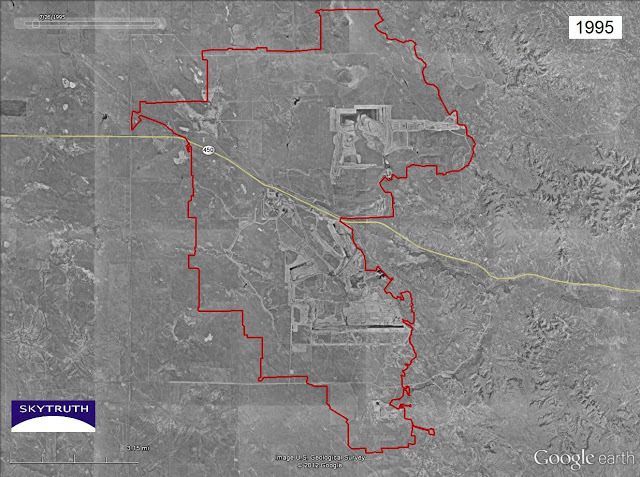 The lighter areas represent active mining area on this black-and-white aerial survey photography. The red outline represents the extent of mining activity as of 2011. 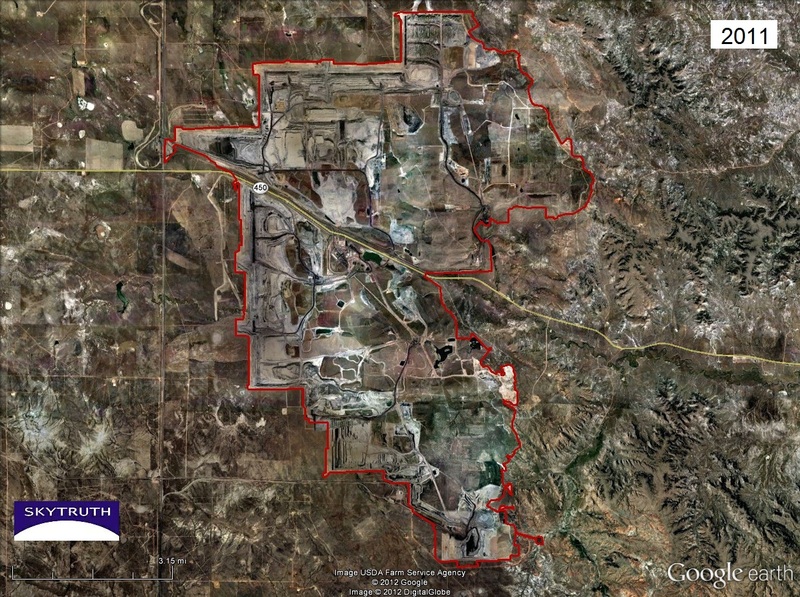 The Black Thunder Mine, located in the Wyoming section of the PRB in Wyoming, as of 2011 (color aerial survey photography). Map of San Francisco, California. 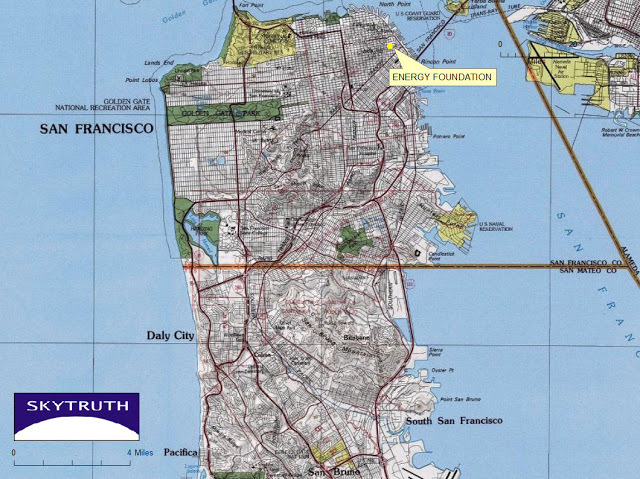 The Black Thunder Mine, from the PRB, superimposed onto a topographic map of San Francisco, CA. Remember, this is just one of the huge mining complexes that already exist in the PRB. 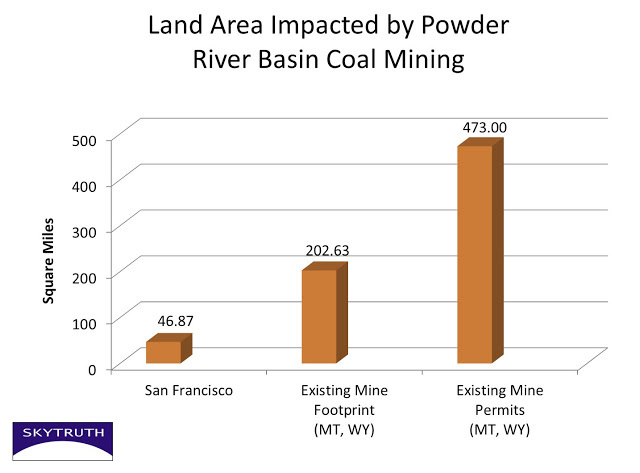 So how much of our Western high-plains landscape is currently impacted by mining? And how much is that likely to grow, especially if we start systematically exporting our coal to foreign countries? 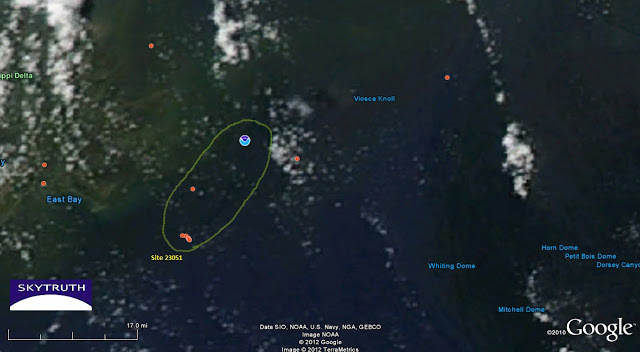 I’d already delineated the existing mine footprints on the 2011 Google Earth imagery. I then collected GIS data from state agencies in Montana and Wyoming for all the current mining permits in the PRB. The permits show the area where mining operations have been approved by state regulators, so it’s likely most if not all of that area will ultimately be impacted. Below is a graph that neatly expresses how large the mined area in the PRB is compared to San Francisco– and more astoundingly, how large the mines may grow. If all the currently permitted areas were used to the full extent for coal mining and coal mining related activity, that would double the area of disturbed land, big enough to swallow up ten San Franciscos! Exporting coal will speed up the mining and make this much more likely to happen. This analysis doesn’t attempt to predict the additional coal leasing and new mine permitting that would probably be driven by exporting coal. 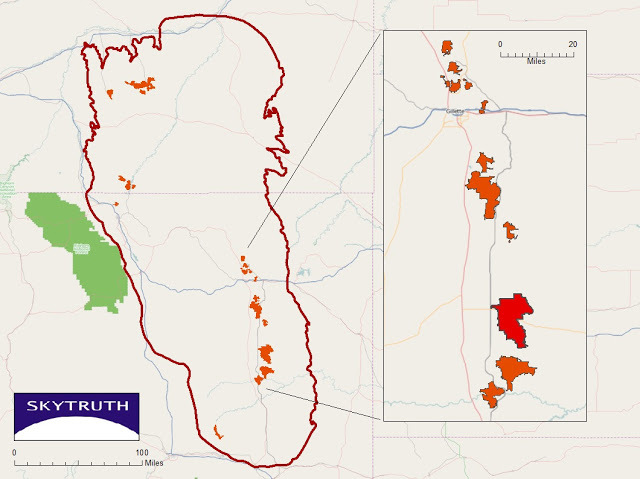 Area of land in the Powder River Basin affected by coal mining activity vs. the area of San Francisco, CA (sq miles). Delaware City Refinery: When is enough really enough? Now PBF is saying, yeah, never mind. We’re going with tar sands instead. Company spokesperson Linda Lindsey now says that she can ‘confirm that we are delaying future commitments to Clean Fuels venture’ as reported in Delaware Online on July 21. Now the company’s new focus is on “lower-cost, high sulfur supplies from Canada’s oil sands fields and the shale regions of the Midwest”. Seems PBF had been dragging their feet in the permitting process for their Clean Fuels expansion project, and now that has been put on the back burner in favor of increasing their deliveries of crude oil by railroad rather than tankers. Now, instead of the creation of Clean Fuels, the area will have to deal with more rail traffic to transport that crude from Canada, North Dakota and Montana to Delaware. Back in March, the Delaware City Environmental Coalition set up air monitors in three different locations near the Delaware City Refinery to test the air quality. The Refinery itself paid $32,000 last year for baseline testing, and this followup air quality testing was paid for from fines levied by polluters. The results of those tests are here on this PDF from the Delaware City Environmental Coalition’s website, and those results are pretty scary. High levels of sulfur dioxide, benzene, xylenes and other particulate that don’t seem all that healthy to be breathing every day. 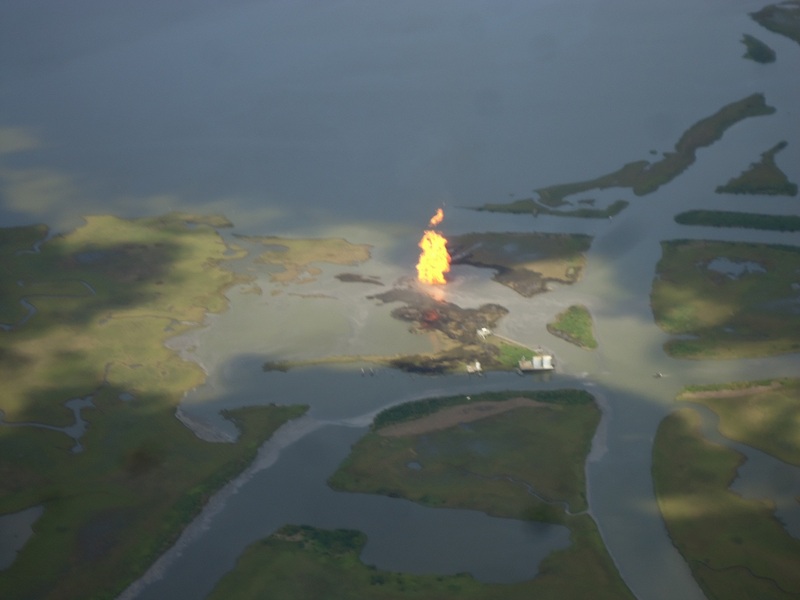 While no one from the refinery was present when these results were announced to the public, the refinery was given the results, and has had those results since they were released on May 19. 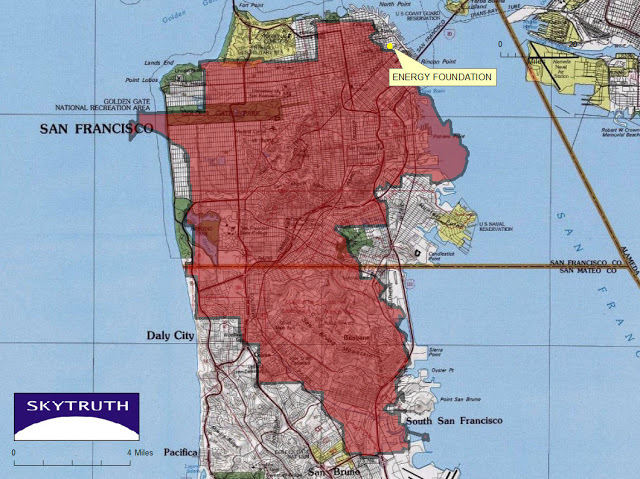 At the last community advisory meeting held on 7/17, the refinery stated that they were “still looking into it” according to Sarah Bucic, Co-Chair of the DCEC. If there have been any improvements, they have not been communicated to the public. You might also remember that we blogged about a continuous release of hydrogen cyanide at this refinery back in October of 2011. The first reports about the hydrogen cyanide release came in to the NRC on October 2nd and continued daily until October 26th. When do you say, okay, we’re making enough money, now let’s concentrate on the quality of life for those living in the surrounding area of our facility? They talk a good game until the almighty dollar enters their sights. Then all bets are off. /wp-content/uploads/2016/08/test_logo.png 0 0 Teri Biebel /wp-content/uploads/2016/08/test_logo.png Teri Biebel2012-07-25 19:42:002017-09-18 16:52:10Delaware City Refinery: When is enough really enough? This flaring has been going on for at the very least 3 and a half years, folks. And that’s just as far back as I went looking at imagery. It’s probably been much longer than that. As a non-expert in all things technical, I asked myself the question: What is flaring? What’s the purpose? And according to Wikipedia, flaring is done at petroleum refineries to release raw natural gas created during the process of refining oil. The article also goes on to say that to keep the system functional, a small amount of gas is always burning, like a pilot light, so that the system is always ready as a safety system when over pressurizing occurs. A pilot light is one thing, but to be able to see these giant flares on satellite shows that everyday there is flammable gas being released and burned off by these flares. What is that doing to the health of those living downwind of these flares? This is not just a problem in Iraq. We’re increasingly flaring off natural gas here in the US, mostly because of the booming Bakken oil play in North Dakota – Montana. Those oil wells also produce gas, but there aren’t any gas pipelines to take it to market. So it’s just being burned off. What a waste of this resource. According to the July 12 NRC report about the oil leaking from Site 23051, there was a spill of 7.43 gallons of oil with a visible sheen reported to be 9.3 miles in length and 200 feet wide. This report was based on observations during an overflight that occurred at 8am that day. 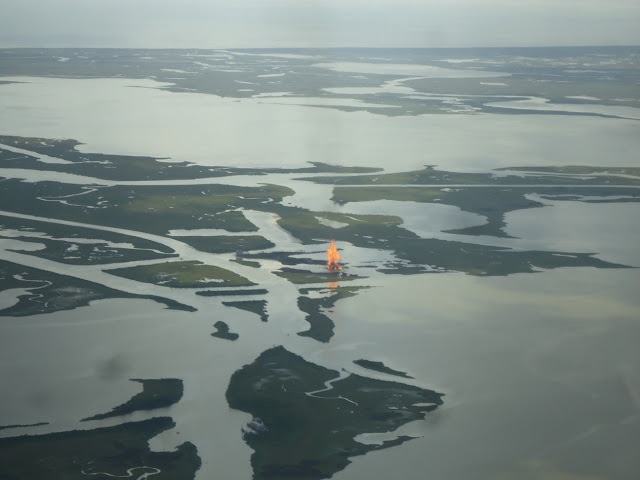 Taylor Energy is required to fly over the site every day and report any oil in the water. We assume this is the report filed by Taylor or their contractor. Our SkyTruth Alert calculations suggest that a slick of that size should hold about 241 gallons of oil (we assume a minimum average oil slick thickness of 1 micron). But there’s more. A “Good Samaritan” passerby (another helicopter pilot) sighted a slick 15 miles long at 2:10pm, at a location about 15 miles northeast of the Taylor leak site. 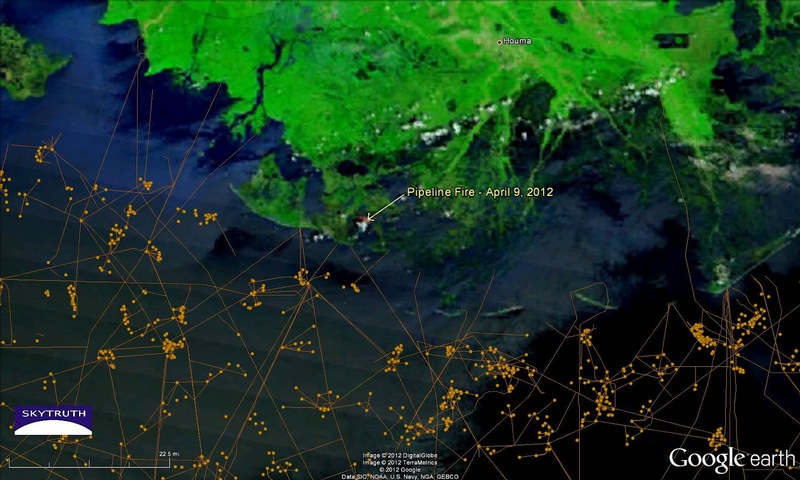 This report prompted the Coast Guard to request an investigation and oil slick trajectory forecast from NOAA. We think the passerby sighted the far end of the Taylor slick. 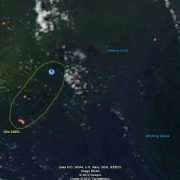 If you look carefully at the MODIS satellite image below, taken at about 1:45pm, you can see a faint, dark streak apparently emanating from Site 23051 that appears to connect to the location of the Good Samaritan’s report. 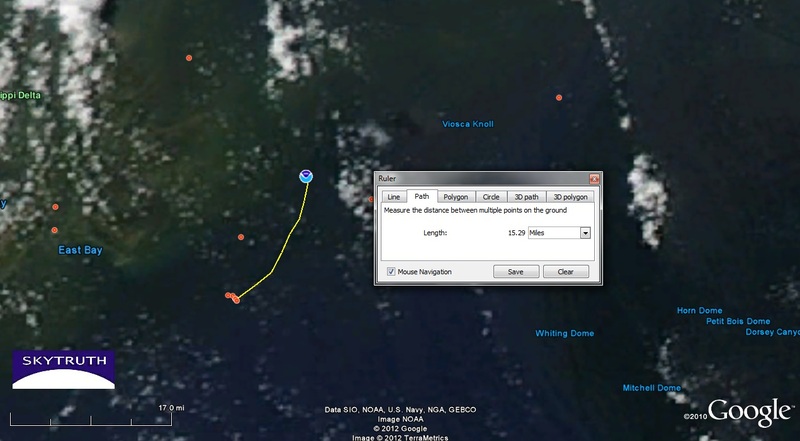 We think this is the slick reported both by Taylor and by the Good Samaritan, and we think It’s unlikely that the slick grew 6 miles in length in the 6 hours that elapsed between the Taylor report and the Good Samaritan’s report (and corresponding MODIS satellite image). Yet another reason we’ve become increasingly skeptical about the accuracy of the reports submitted by Taylor, and critical of our nation’s reliance on polluter-submitted reports overall.